KOTZEBUE, Alaska – Firefighters have contained and controlled the Eli River Fire at Noatak National Preserve. The lightning-ignited Eli River Fire is located about 15 miles southeast of the village of Noatak. The current size of the fire is 276 acres, based on GPS data collected today. The fire was reported at approximately 1 am on July 17, 2015 by a private citizen from the village of Noatak. 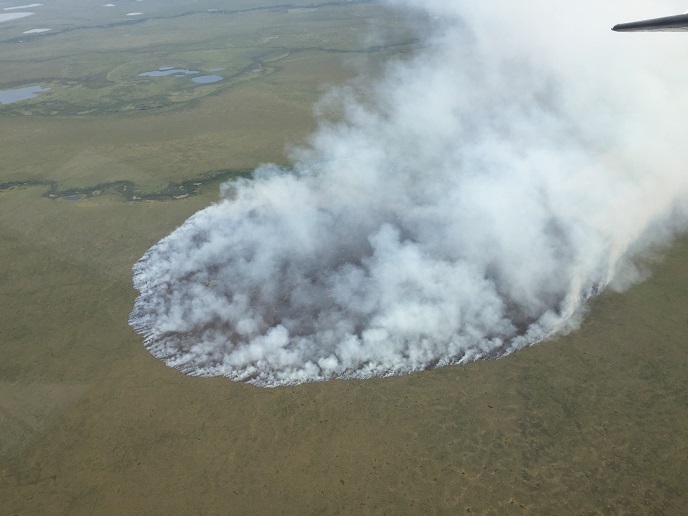 As of noon on July 17, the fire was approximately 20 acres in size, with a 90% active perimeter, creeping, backing in tundra, and grass in a full suppression management area. Due to the proximity of the fire to a native allotment, located upslope to the east of the fire, it was determined that action needed to be taken. Eight smokejumpers, air attack, and a fire boss worked to achieve containment. By 4:30 pm on July 17, the fire had grown. The fire area received light precipitation throughout the afternoon and evening. Smokejumpers worked their way around the fire by the evening of July 17. The fire has now been contained and controlled. The smokejumpers planned to be demobilized today. Fire managers will continue to monitor the fire by air. This will be the final fire update unless significant changes occur. Statewide wildfire information is available at http://akfireinfo.com or http://fire.ak.blm.gov or by calling the Joint Information Center at (907) 356-5511. Additional park information is available on the web at www.nps.gov/noat.